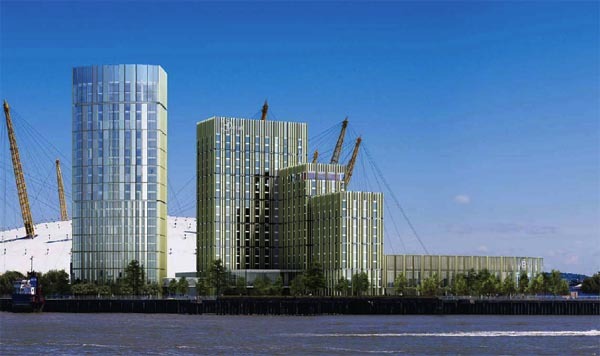 Greenwich Council gave planning consent to a huge new hotel next to the O2 on the Greenwich Peninsula last night. The 452 bedroom hotel will be accompanied by a tower of 100 serviced apartments and a 3000 sq ft ballroom. Hundreds of new jobs are expected to be created at the new hotel which will have more bedrooms than Greenwich's Holiday Inn, Novotel and Devonport House hotels combined. The large ballroom will be used as an events space and designers claim it will compete with Park Lane hotels to attract "thousands of events to Greenwich". The apartments are residential properties with additional services provided such as laundry and hotel-style room service. The apartments will be sold on the open market and the owners will be able to choose whether or not to add them to the hotel's pool of properties which it will manage and rent out to guests. The site of the development is a 3 hectare plot of land directly to the west of the O2, previously known for planning purposes as N0301. It consists of three separate buildings in a stepped profile - the serviced apartments tower being the tallest of the three at 24 storeys. 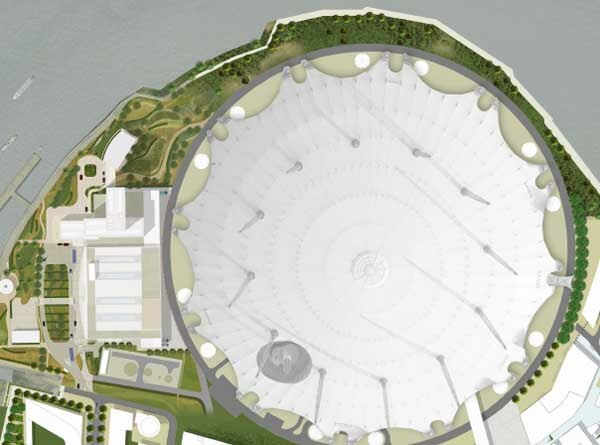 Local MP, Nick Raynsford, offered a withering assessment of the designs when they were first unveiled earlier this year, describing them as "a complex of not very well related buildings which leave the impression of being a cross between a grain silo and a Soviet-era Palace of Culture". Modifications have been made to the design since then but the Greenwich Society and Greenwich Conservation spoke against the plans at last night's meeting. Philip Binns from the Greenwich Conservation Group told the meeting last night that the proposal was not the "impressive signature building" originally envisaged in the Greenwich Peninsula Masterplan. John Franklin from the Greenwich Society said that they wanted to see "the best building with the very best impact" and that the hotel was supposed to have been "the dominant development". The Greenwich Peninsula Masterplan of 2004 envisaged a hotel building being the tallest building on the Peninsula and granted outline planning permission for it to be built up to a maximum height of almost 104 metres. The new proposed development will only reach 93 metres and won't be the iconic tower some had hoped for. Philip Sandilands, director of Lifschutz Davidson Sandilands, defended his plans, saying that a taller building "wasn't feasible", citing concerns over flight paths and the nearby pumping station. He said that the previous design had been "overbearing". Cllr Dermot Poston responded by saying that the hotel was "supposed to be the iconic plan of the Peninsula". He commented that "the very nature of a tower is that it's overbearing". He told Mr Sandilands, "I don't follow what you're saying. It doesn't make sense to me at all", labelling the project as "an absolute disaster". Council Leader Chris Roberts said he was "comfortable" with the designs. He commented that development in the area had already deviated from the Masterplan with the tapered profile of the Ravensbourne College and Mitre Passage buildings to the east of the O2. The proposal was voted through by the Planning Board on a majority of 5 - 2. Councillors Chris Roberts, Denise Hyland, Steve Offord, Ray Walker and Jaghir Sekhon voted in favour of the application. Councillors Dermot Poston and Geoff Brighty voted against. as long as they leave the Thames Path intact…. Yet GHT will still want to build a small hotel next to the market. GHE’s proposed hotel certainly ain’t small – over 100 rooms, two-thirds the size of the Novotel.